Who doesn’t love crumble? It’s one of the most humble desserts – with its crunchy topping and par-cooked fruit, served with a dollop of double cream and ice-cream, who can resist? I must admit, I usually don’t make my crumble with a recipe – I throw in whatever fruit has been left a little too long in the fridge, a few spices, scatter with some nuts and oats – and whack it in the oven. 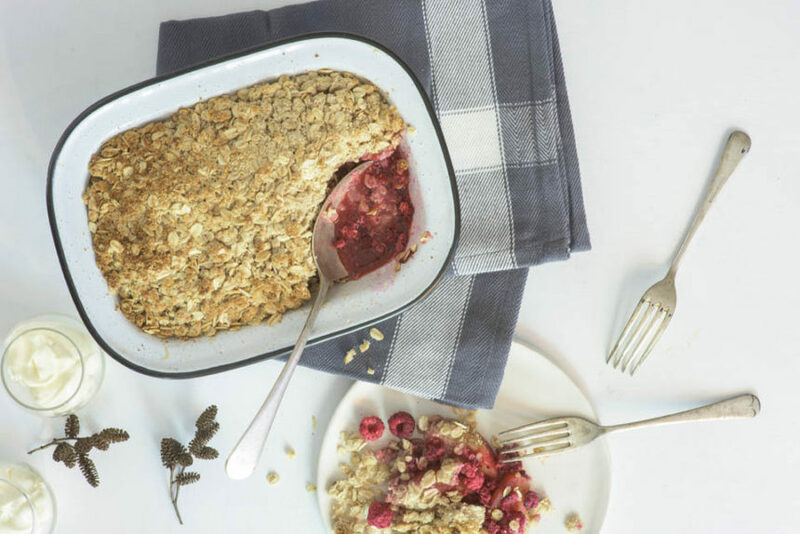 I have spent some time perfecting this raspberry and apple version, to get the perfect fruit-to-crumble ratio and just the right amount of maple syrup to ensure it is sweet enough (without adding too much unnecessary sugar). Using frozen berries in desserts is a clever way to add flavour and vibrant colour in colder months however this recipe works with almost any fruit combination – apple and rhubarb, blueberry and raspberry, pear and cherry. Peel, core and quarter the apples and cut into even-sized small chunks. Place in a medium saucepan with raspberries, maple syrup and cinnamon. Add 4 tablespoons of boiling water. Cover and simmer for 10–15 minutes or until the fruit is cooked (but not so soft that it breaks up). In a small saucepan, heat maple syrup, butter and cinnamon until melted. Place ground almonds and rolled oats in a bowl. Pour melted syrup mixture over and stir until the oats and almonds are coated. Lightly spray a 24 cm (9ó inch) square baking dish with olive oil spray. Transfer softened apples and raspberries to baking dish and scatter crumble evenly on top. Bake for 25–30 minutes or until the crumble is golden. Serve with a generous dollop of double cream and your favourite vanilla bean ice cream.